Home > Article, Carbon 14 Dating, History	> Did Jesus Survive the Crucifixion? Did Jesus Survive the Crucifixion? The Sudarium provides strong, independent evidence for the authenticity of the Shroud of Turin. If the Shroud is a fake, then the Sudarium must also be so. This makes the job of any potential forger close to impossible. The two cloths authenticate and validate each other and together they provide a strong case for being the original burial cloths of Jesus. 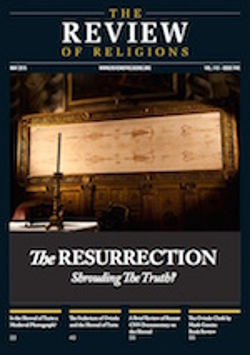 The current issue of The Review of Religions, an international magazine published by the Ahmadiyya Muslim community, carries an article by Arif Khan, The Sudarium of Oviedo and the Shroud of Turin. The Review is an international magazine published by the Ahmadiyya Muslim community. It has been in print since 1902. The current cover of the print edition is pictured. The fact that the Shroud and the Sudarium were together at one time not only authenticates the Sudarium but also crucially proves the authenticity of the Shroud itself. Ever since the carbon dating results hit the world’s media on October 13, 1988, stating the Shroud dated from 1260 – 1390 CE, there has been a major debate concerning the Shroud’s age. Several scholars have written about why the carbon dating result for the Shroud is incorrect, the most convincing being by Raymond Rogers. He argues that it is possible that it dated from the 1st Century. The link between the Sudarium and the Shroud however, casts major doubt over the accuracy of the carbon dating result. The Sudarium is known to have existed hundreds of years prior to the 1260 – 1390 dating result attributed to the Shroud. There is documented evidence, surviving to this day in the Capitular Archives of the cathedral in Oviedo, of the Sudarium being seen by King Alfonso VI and several others on March 14, 1075. The ark containing the cloth was officially opened on this day, and the event recorded. Even in 1075, it is stated that the ark had been in the church for a long time. References to a Sudarium exist from as early as the Gospels themselves, but proving the Sudarium of Oviedo was the same Sudarium is difficult. The existence of the cloth in 1075, however, is something attested to and officially recorded. Given the proof that the Sudarium and the Shroud covered the same body, and the proof that the Sudarium was definitely in existence in 1075, the carbon dating results of the Shroud of Turin have again been thrown in to doubt. Despite this strong evidence, it is not possible to definitively prove that both the Sudarium and the Shroud of Turin dated from the 1st Century. However, it is possible to conclude that given the proven connection between the cloths, the carbon dating result for the Shroud of Turin is incorrect. Once the carbon dating result for the Shroud is discarded, the case for the authenticity of the Shroud of Turin outweighs claims that it is some form of fake. The strong similarities between the Sudarium and the Shroud, mean the Sudarium now has a high probability of also being authentic. A key reason for this magazine taking an interest in the Shroud of Turin is that several scholars have argued it proves Jesusas survived the crucifixion, thus validating the belief and teaching of Hazrat Mirza Ghulam Ahmadas. There are Shroud researchers who have reached this exact same conclusion based upon their study of the Shroud of Turin. Those that have argued this viewpoint draw attention to the large amounts of blood on the Shroud, and highlight that it would take an active heart to produce this. Others have stated that for an even formation of the image, the body would need to have been at a constant temperature, again requiring a living body. However, the scholars that hold this view concerning the Shroud are in a minority, and this is un-surprising given that it is a Catholic relic and the vast majority of those who have taken an interest in researching it come from a Christian background. Does the Sudarium shed any light on the question of Jesusas surviving the crucifixion? So what do you think? Any chance that Jesus survived the cross? I believe that the Divine Almighty Soul of Jesus The Christ survived the Crucifixion but not his human body. On the 3rd day his physical body was transformed as his Almighty Soul re-entered the body. Absolutely NO! The Man of the Shroud and Sudario was dead. (the link may not load, so I can send the paper to you). 6. The man was dead. The mechanism that formed the stains is incompatible with any kind of breathing movement. O.K., I had no problems loading the Faccini etc 2008 article from the URL. It seems to cover the main issues fairly well. I wondered at your point 6, and at first speculated that if the image was formed in a very brief moment of time, any breathing action might not necessarily result in a blurred image, however the authors seem to be referring to the blood stains. They also make the point that asphyxiation would occur within about 10 minutes, even in the case of a loosely draped cloth. My understanding of the spear wound is that it was a Roman legal requirement before the body could be handed over to family, and this was to ensure that the body was in fact dead. I seem to recall that Barbet carried out experiments with cadavers, and on simulating the wound, he obtained both blood and serum, the “blood and water” of John’s gospel. Wilson has a picture of the Dying Gaul statue in Rome, with precisely that spear wound, which was apparently taught in the military academies. Fundamentally, I see the posting above as an attempt to rationalise and support the Koranic doctrine that Jesus did not die as a result of his crucifixion, but despite their arguments above it would seem not to be supported by the TSM. Dan had a recent posting of some Islamic pilgrims to the exposition in Turin. Such interest in the TS is intriguing, and I wonder what conclusions they might have come to as a result. Without knowing any scientific research (today), the fisherman John mentioned that the blood and water came from the body to prove that Jesus was really died on the cross. That is is why I like Gospel of John very much. It gives us a good summary of Jesus mission, his death and also the resurrection (including the burial clothes). The old saying is that if you repeat a lie often enough people will believe it. I find it strange that all of the forensic pathologists who have studied the Shroud say the man was dead. I guess their testimony doesn’t mean anything. That old saying is much more skeptic/atheist friendly than religious friendly in my humble opinion. Not everything being repeated often is a lie, as is not everything what people believe. Atheists must repeat their lies often enough to be believed, while believers repeat the truth of Jesus’ Death and Resurrection because it is worthy of being repeated. The ball is on the other side of the court. Which is the historical base to claim that Yuz Asaf was probably a sufi mystic ? In the case of the Holy Shroud we are lucky because in the past Prof. Baima Bollone worked on blood, etc. successful reports to read and comment! >At the time when Olsson was in India, Chief Minister Farooq Abdullah of Kashmir owned the waqf (trust) that controlled the Roza Bal tomb in Srinagar. > Olsson says he gave his approval for her DNA research there, which was to be led by several respected Kashmir University professors of history. >Modern mainstream Christian scholarship has generally rejected theories of Jesus in India; Mathias Mundadan, general editor of History of Christianity in India, described them as “a work of fiction. The strange story about Yuz Asaf lasts a long time and then I do not see what level of credibility could have the sect of Ahmadhia if they are not even able to present evidence (on DNA or on other significant issue) obtained with modern technologies. >The Rozabal Line deals with the subject of Jesus having survived the crucifixion and having settled down in India. The fictional element is much like Dan Brown’s The Da Vinci Code whereas the historical basis is derived from several other books on the subject including “Jesus Lived in India” by Holger Kersten and “The Unknown Life of Jesus” by Nicolas Notovich. According to Tehelka, one of India’s most respected weekly news magazines, The Rozabal Line is “a thriller that inquires into the controversial claim that Jesus Christ travelled to India and was buried in Kashmir’s Rozabal Tomb”. Is that strange book suitable only for “poor Irish homosexuals”…( and so on)… ? Is it really possible that (in this year 2015) we have no accurate genetic profile for those peoples? It is the local Kashmiris who believe that Yuz Asaf was a Sufi mystic. He must have come from Iran to India and Pakistan did not exist then.You must remember that both Hindus and Muslims in India and Pakistan do not believe in the “Jesus in India” fiction. Other than the book by Father Mathias Mundadan, CMI you cited I would recommend the one by Professor George Mark Moraes, who was head of the department of history at the University of Bombay (Mumbai). Thank you for your interesting and detailed response. result obtained from the analyses on ancient DNA can be surprising as I believe you already know. However now I was watching something on nanosensors (… to apply in order to detect something of useful on linen fibrils…). As you know I am always a bit ‘haunted by my idea of “nanomechanical dating”. Yes Louis Jesus did not go to India but according to legends St Thomas went to Kerala and later some Jewish traders went to Sri Lanka and established a small Christian community in 4th centaury. Recently they found a Nasrine or Persian cross in place call Anuradhapura and now that cross is in Anuradhapura (small) museum. However Sri Lankan Methodists printed a sketch of that cross in the front cover of their Hymn book. I am planning to go to Kerala to find more information about the mission of St Thomas. The Saint Thomas church in Mylapore, Tamilnadu, India is said to contain the remains of the saint but documentary evidence is not easy to find. If you go to India you may find what you are looking for in the city of Ernakulam. Thanks Louis I have been that Church in Mylapore. Louis, when I clicked on your “thehindu.com” link just now, the service was unavailable, probably maintenance. I have heard of a few other small communities of remnant early Jewish Christians, I think possibly in the Mediterranean, but I’ll check my archives. As I recall they were typically persecuted by orthodox (read Hellenistic?) Christians. The “Jesus in India” cult would seem to me to originate with a more general phenomenon of wanting to legitimize claims for particular national forms of Christianity by tracing the cult back to apostolic origins. We see it in some claims for a few ancient churches wanting to trace their origins back to a particular apostle. The legends concerning St James in NW Spain might be another example. A more modern example would be found in the myths from the Book of Mormon. Daveb, try clicking on the hindu.com link provided above and it may take a minute to load. The other link “The Quest for Jesus in Shroud research”, also provided above, gives the story about the origin of the “Jesus in India” (Kashmir, North India) myth propounded by the Kersten/Gruber duo. It is entirely agenda-driven. Let me know if you have difficulties clicking on the second link. The story of the apostle Thomas (Kerala/Tamilnadu, South India) is something really different, partly grounded in history. I remember reading a book call, ” The Passover Plot” back in the 60’s(That’s about all I remember of the 60’s, well maybe wookstock also). If I remember correctly it had the same idea that Jesus didn’t die on the cross. If a man is beaten that badly I just don’t see him up and around a few days later. Hugh Schonfield admitted that he was writing fiction after “The Passover Plot” was published. May I suggest a fascinating work by one of the top American New Testament scholars? It is “The Real Jesus”, by Professor Luke Timothy Johnson. Has there ever been a case of any person surviving a crucifixion – documented or anecdotal? Of course not. So Jesus would have been the only one to do so? Pretty stupid line of reasoning. Crucifixion often took a very long time to kill its victim, and people could be rescued if circumstances permit. I think the best documented case is by Josephus, who personally requested that someone he knew be reprieved. After the fall of Jerusalem there were so many crucifixions that it would very likely that at least some were rescued before they died. Of course, if Stan is defining death as irreversible, then no one who has died has ever been revived, but by various other definitions, both in ancient times and now, recovery from apparent death is neither impossible nor undocumented. Josephus actually documented at least one–I think it was actually 2 or 3–friends of his who did survive after being on a cross for several days. I don’t know the exact citation but it could probably be found by googling something like “surviving crucifixion.” Obviously those are rare cases. Since death does not follow immediately on crucifixion, survival after a short period of crucifixion is possible, as in the case of those who choose each year as a devotional practice to be non-lethally crucified. There is an ancient record of one person who survived a crucifixion that was intended to be lethal, but that was interrupted. Josephus recounts: “I saw many captives crucified, and remembered three of them as my former acquaintance. I was very sorry at this in my mind, and went with tears in my eyes to Titus, and told him of them; so he immediately commanded them to be taken down, and to have the greatest care taken of them, in order to their recovery; yet two of them died under the physician’s hands, while the third recovered.” Josephus gives no details of the method or duration of the crucifixion of his three friends before their reprieve. These men were not speared in their side yet nor were their legs broken. Another thought is were the nailed onto their cross or just tied. Were they beaten as bad as Jesus was as per the Shroud indicates ? That’s right. There’s no point in appealing to Josephus. Dr James Tabor’s rendering of relevant extracts from Josephus relating to crucifixion. Includes refs to Antiochus Epiphanes (see Maccabees), Jesus’ crucifixion, Jewish Wars under Titus etc. Very unpleasant reading. Josephus mentions three friends crucified who were taken down at his request, but only one survived. Tabor has conscientiously marked those passages which were likely inserted by Christian redactors. At one stage during the Jewish Wars, they ran out of wood to set up the crosses, there were so many condemned. John confirmed in his Gospel that Jesus really died. Who is not believing that? John 19:32-35 – “So the soldiers came and broke the legs of the two men on the crosses beside Jesus. 33 But when the soldiers came close to Jesus, they saw that he was already dead. So they did not break his legs. 34 But one of the soldiers stuck his spear into Jesus’ side. Immediately blood and water came out. 35 The one who saw this happen has told about it. He told about it so that you also can believe. The things he says are true. He knows that he tells the truth. >Ruben Enaje is a Filipino carpenter, sign painter, and former construction worker. He is noted for being crucified 29 times. >Villagers in the northern Philippines took Easter celebrations to a violent extreme Friday by recreating the crucifixion of Jesus. extinguished the faults of men. >founded The Summit Lighthouse with her husband Mark Prophet (1918-1973), which became the Church Universal and Triumphant in 1975. The Church lost members after her failed prophecies of nuclear war in the 1980s-1990s, and Alzheimer’s Disease caused her to retire from the ministry in 1999. My film has put a disclaimer right in the beginning that we make no final claim. We do not want to show disrespect to anybody’s religious beliefs. However, personally I am fully convinced that this is the tomb of Jesus Christ. Proper unbiased scientific investigations, like the DNA testing of the tomb, must be done now. And the shrine must be protected & preserved by the Gov. of India as a common heritage of mankind. only few believe in this idea. does not seem to prove much. … there are forensic experts from spain, GB and Germany, who are absolutely sure that the TS man must have been alive. I find the work of the forensic scientists, particularly Dr. Bob Bucklin, to be particularly convincing that the man in the Shroud image, no matter who you think it is, was without any chance of doubt, dead. That is a certainty if one can believe an expert in his own area of expertise who proved the man in the Shroud was deceased. For this reason, and knowing that this paragraph is written by those who have a vested interest in making this statement (a dead Christ who affects the lives of billions of Christians cannot be countered), I would dismiss it in light of the experts’ forensic science and its conclusions. Contributions to the Evaluation of the Circumstances Surrounding the Burial of Jesus of Nazareth” I have recently been introduced. He is convinced the image was made from a living man, and gives detailed forensic reasons for his opinion. To say nothing of Wolfgang Bonte, President of the International Association of Forensic Sciences, who also believed the man in the Shroud was alive. I do not agree with their conclusions (what cheek!) and I do not approve of “my expert is better than your expert” squabbles anyway, but it does go to show that there is no universal professional consensus even about whether the man was alive or dead, let alone whether he was washed or not, or whether the blood is realistic. Individuals may have personal faith in one man or another and good for them, but to insist that everybody else does the same is unreasonably unwarranted. El forense Miguel Lorente Acosta ha sido profesor auxiliar en el departamento de su HERMANO, el forense Jose Antonio Lorente Acosta, que es el CATEDRÁTICO de Medicina Legal (Medicina Forense) de la Universidad de Granada. Los 2 hermanos son partidarios de la AUTENTICIDAD, pero discrepan en si Jesús vivió o murió. Como el “rigor mortis”es EVIDENTE a los ojos forenses, Miguel Lorente Acosta interpreta el “rigor”como un cuadro de TETANIA por hipocalcemia aguda grave…..pero parece ignorar que para “sobrevivir” a una tal grave hipocalcemia aguda, aún en el siglo XXI, solamente puede tratarse con la administración INTRAVENOSA de calcio (Ca) bajo control por MONITORIZACION. Reminder for Hugh: a paleopathologist, an archaeological bloodstain pattern anaylst, a Second Temple period funerary archeologist and a professional cryptologist (familiar with paleopathology and/or, archeaological bloodstain pattern analysis and/or Second Temple period funerary archeaology) are best qualified than you to tell if the TS man bloodied body imprint is that of a dead crucified victim who was buried according to the burial custom of Second Temple period Judeans. You’re probably right, Max. Unfortunately, no such people exist, so we’ll just have to do the best with what we’ve got. Alive or dead, the pathologists all seem to be of a mind that the image is at least that of a real human being, male gender. Not a painting, not a statue, not a bas-relief. Progress? Now what do they have to say about crucifixion, and who is it meant to be? Footnote – Constantine proscribed crucifixion as a capital punishment in 325 AD. Hugh, Who knows, if the image was formed at the instant of the Resurrection, that is, the split second between death and life, that is what is creating the confusion. Who indeed? But the eminent, experienced, highly qualified, professional pathologists quoted above claim the Shroud is evidence that the man in it was never dead in the first place. Come on, Hugh. Was it more difficult to kill Jesus than Rasputin? I’m basing myself on the gospel accounts. Miguel Lorente Acosta: Our hypothesis is that during the process of the preparation of the body, it was discovered that Jesus had not died on the cross. It is not an idea conceived beforehand nor is it a questioning of seemingly inexplicable specific events, but rather the consequence of the study of objective elements that appear on the Shroud of Turin. The arguments are to be found in the Shroud itself and have been divided under two broad headings: On the one hand, the signs that indicate that the body which produced the image was not that of a dead person, and, on the other hand, the evidence of signs that somehow reflect vitality in the elements of the Shroud. Obviously there could have been no flow of blood during the event, which must have been near-instantaneous, if not instantaneous. Peer-reviewed papers by Drs. John Heller and Alan Adler have demonstrated that the blood is real and Turin accepted them. You mentioned that you would be going to Kerala shortly and this is an excellent opportunity for you to take out some photographs of the Nasrani culture that still remains in India and make them available to all those who read this blog. The Nasranis were Jewish Christians who probably fled persecution (Bar Kokhba?) and made it to the south of India. Needless to say, this would not have happened if Jesus had survived the crucifixion. Sampath, the relic was preserved by the saints Isidore and Ildefonso, who were bishops of Seville, before being taken to Toledo. However, it was kept in a chest, not in any reliquary. The local clergy will be able to tell you the rest when you get there. If you need more tips contact me by email, which Dan can give you. Thank you so much Louis. if I need more information I will email to you. Earlier when I wrote – “body started moving with the flow of blood” – I realy meant recirculation of blood inside the body and not flowing out blood from the body. You are welcome, Sampath. Being a supernatural event we can never say what exactly happened, except that it was what is called a “glorified body”. I have noticed that at least one well-known NT scholar is confused, but comment is being kept for another paper on Jesus that will soon be published. Thank you Dan, for your invitation – I am the guy, who came to the conclusion that the man under the shroud must have still been alive. I will keep both links active for about 4 weeks. I am tired of ideological disputes. I know that it is written that Jesus died on the cross. But here we are examining a historical object. I am looking for discussions only on the basis of facts and observations. I have read extracts of your book and your medical analysis and presentation of facts regarding the Shroud of Turin, and the image heralding from a living person, a view that I hold very strongly too. Your medical explanation is so powerful and is what I was seeking for a book I am about to embark on writing. I had the privilege of seeing the Shroud for myself on 10th May 2015, it is a topic I have researched for many years. I am writing to seek your permission to use extracts from the above book and others you have written on the subject, using your ‘living body’ not a corpse, evidence in the main. I would be grateful if you could kindly advise me at your earliest convenience if this will be possible. Your research is truly compelling and a must for truth seekers all over the world. Hi Mr. Felzmann; Do you have any idea about the formation of the image on the Shroud if the man under the shroud must have still been alive? The only snag with “the-man-under-the-shroud-must-have-still-been-alive” theory is that the elliptical side wound at the top edge of the blood flow was inflicted post mortem not ante mortem. Besides the blood on the TS misleadingly may look as if it had just been shed the day before not so much because the TS man was still alive on burial as most likely the blood was degraded/lightly or pre-mordanted through specific puryfing and drying burial procedures. Reminder for Helmut: Most likely the sindon/himation (used as inner winding burial sheet) was in-soaked with an alkaline solution in oder to purify the TS man’s shed innocent blood and was dried out through (myrrhic?) aloetic fumigation. Re the use of fumigation/burning aromatic woods/spices in ancient Jewish/Judean funerary rites to honour the deceased in terms of masking or preventing odor problems of the corpse see 2 Chronicles 16:14 – 21:19 Targum. Most likely the bloodstain pattern are lightly or pre-mordanted re-moistened blood. Typo: Most likely the bloodstain patterns are made of lightly or pre-mordanted re-moistened blood. *In the surat An-Nissâ Arabic does surface the phraseology of ancient criminal law in Aramaic or law of Moses regarding stoning to death and hanging the dead body upon a tree. Further to my previous comment, it appears that my recent article on the Sudarium spurred the report cited and it would not have been so if it was in Spanish, which would not have been understood. Further, some of the topmost biblical scholars today, both Christian and Jewish, will laugh out of court any suggestions about Talpiot or Kashmir, and not only because these are agenda-driven. They are at present engaged in an important project involving the significance of the Apostle Paul’s writings to both Judaism and Christianity today. And Paul had an experience of the risen Christ. H.Kersten made at least eighty mistakes and distortions in his “Jesus in India”. acting as a truly linguistic bridge, all the apparent contractions in the three testimonies do vanish and the three viewpoints complementary to one another. Typo: the three viewpoints (NT, Talmudic and Quranic) prove complementary to one another. Note: To slay = to hit, strike to death (with a thrown stone) here. Misleadingly here the use of “crucify” refers to the execution method of Roman crucifixion when actually it shoud have referred to that of Judean posthumous hanging whence the confusion so far. Max says, “the three viewpoints (NT, Talmúdic and Quranic) prove complementary to one another.” Really? Sorry, Max, have you seen the works by Peter Schaefer, Rabbi Jacob Neusner and other authors? I agree with them that there are sources which prove to be contradictory, not complementary. Louis, please re-read my synthesis (if you can read French) of the testimonies of the Gospels, Flavius Josephus, the Talmud and the Qur’an (the contradictions in the testimonies are only apparent. Besides there are many a translation/interpretation of sourat 4:157-158. In the surat An-Nissâ Arabic, verse 157, does surface the phraseology of ancient criminal law in Aramaic or law of Moses regarding stoning to death and hanging the dead body upon a tree. Once you take into account that linguistic fact, all the APPARENT CONTRADICTIONS in the three testimonies do vanish. Reminder: I stick to the theme” Did Jesus Survive the Crucifixion?” in light of the apparent contractions in the NT and Qur’an via the Talmud. on Revelation when I was fifteen years old. Now, I see no need to bring extra-biblical literature, written centuries after the NT, into the picture. Do I need to say that they do not serve as controls, for reasons given in my previous comment? We also have gospels according to Alain Kardec and José Saramago, one used by spiritualists, the other by atheists. David Christie-Murray described the Resurrection appearances as a “psychic event”. In my view he is correct if it is included in supranormal, not paranormal, phenomena. Actually when it comes to Yeshua’s survival to crucifixion, those who advocate the theory are all too proned to quote surat 4:157-158, which indirectly refers to the BabylonianTalmud, Sanhedrin 43a, which in turn refers to the Four Gospels. In other words, literarily speaking, Yeshua’s survival to crucifixion is extra-biblical per se. My own personal translation/interpretation of the short passage from verse 157 does tend to linguistically solve the testimonial discrepancy in the Gospels, the Talmud and the Qur’an and harmonized their apparent variations. To my knowledge, this had never been attempted before and should be done. First, using them to judge NT (first century) narratives would be a gross extrapolation, they simply do not serve as controls. that Jesus was not crucified and the scripture has been interpreted in this light. Have you ever considered heavy sweating (on the way to Golgotha) could have washed out most of the blood on the TS man’s back and the seamless tunic woollen fibers soaked up the blood and sweat? Have you ever considered heavy sweating too (on the cross) could have washed out most of the blood on the TS man’s face and a pre-burial face cloth/smaller shroud coul have soaked up the blood and sweat? Have you ever investigated the possibility of the TS man’s bloodied body having been subjected to Second Temple period specific burial procedures in terms of re-moistening and drying out and the corpse having been turned from one side to the other side (with no stasis in supine position but with blood puddling on each side) so as to counteract arms rigor mortis and forced them from adduction to abduction prior to wrapping his bloodied body in shrouds? Have you ever investigated the possibility of post-mortem hyperthermia coupled or not with (myrrhic?) aloetic fumigation? Have you ever considered the way the TS man’s bloodied body could have been wrapped in shroudS along with “aromaton” (a koine Greek word that can refer not only to spices but also fresh flowers (used both as insect repellent and symbolical token of affection)? I am grateful and surprised to see my article features on this blog, thank you for posting it and presenting a fair and accurate summary of the points I made in it. A couple of items I wanted to comment on. We can debate about extracts from the differing Gospel accounts or bring up the Quranic verses on the Crucifixion, yet in fact the Shroud itself – if proved genuine – will actually be the best possible ‘eye witness testimony’ as to the events that took place. Over the years I have observed that a large majority of those who study the Shroud of Turin are believes in Jesus and his physical resurrection. When I’ve hoped to get objective and scientific analysis around if the man of the Shroud was still alive or dead often religious belief, especially relating to the authenticity of the account in the Gospel of John, seems to win out. I saw this in the late Dr Fredrick Zugibe’s book. It would be really good to get independent analysis on the different theories from a pathologist. If we do have this I would be very interested in seeing it. As others have correctly pointed out there are accounts of people surviving Crucifixion in 1st Century Palestine. We know that certain sections of Josephus are interpolated, but have no reason to believe this about sections where Josephus talks about three of his friends hanging on crosses. He asked for them to be brought down, and they are and two do die, but one survives. Crucifixion usually took several days but Jesus’ was cut short due to the Sabbath. I was not aware of the work of Dr Felzmann – thanks to this Blog I will now be able to connect to him. Thanks again for the balanced coverage of the Review of Religions edition, and my article in particular, on this website. I’d be more than happy to keep in touch with the author and other readers. Pilate released Bar Abba and had Yeshu’a to be scourged as a criminal sentenced to death prior to his execution by means of crucifixion, yet in the hypothesis the TS man is Yeshu’a, the latter was not subjected to fustigatio (a simple beating with rods or canes for minor offences) or flagellatio (a more severe beating with rods or whips, merited by criminal acts) but verberatio (a scourging of the most severe kind), which accounts for his rapid death on the cross. Actually Pilate was surprised to hear that Yeshu’a died after only three to six hours on the cross since, most likely, te former was not aware the latter had first been subjected to verberatio (not just flagellatio) that is a savage flogging with a flagrum-type device because of the wanton cruelty of his executioners. Most likely, Yeshu’a already suffered from a bi-lateral pleural effusion when he was hanged to the wood of the cross (see The Sudariumof Oviedo evidence). Besides, it not only depended on the victim’s physical condition but on the way his body was hung upon the wood of the cross too and, in particular, on the presence or absence of a peg driven into the upright that he straddled or sat upon sidewise (sedile) and/or a footrest (suppedaneum). They could make a world of a difference. Not to mention the time of year and/or day the victim was crucified. “Actually Pilate was surprised to hear that Yeshu’a died after only three to six hours on the cross since” – someone heavily experienced in Crucifixion. Yes, the scourging would have weakened Jesus, but the idea of Crucifixion was a long drawn out punishment. The pleural effusions do not specifically point to death. Joseph and Nicodemus quickly obtained the body and tended to it with healing herbs – Aloes and Myrrh. In terms of the time of day and time of year – it is interesting how three of the Gospel accounts talks about of ‘darkness’ at the time of the Crucifixion. There is also an earthquake mentioned and people fleeing. While these could me later embelishments, if they occured they would also help allow Jesus to survive. Dear Arif: I commend to you the work of Pierre Barbet, “Doctor at Calvary”, a work that you may already be familiar with. Barbet discusses the ‘Wound in the Heart’ at great length and in great detail, and he conducted a number of experiments with cadavers, piercing them in a similar way as shown on the Shroud. He obtained similar results as recorded in John’s gospel. In death, the right auricle is always filled with blood, and the ‘water’ that flowed out was pleural fluid. Barbet obtained the same flows. The blow given was a Roman legal requirement before the body could be released to family, to ensure that death had occurred, and if the person happened not to be already dead, death inevitably followed this blow, the “percussio”. It was a blow taught in the military academies. The exact wound is depicted in the “Dying Gaul” statue in Rome. Certainly, Barbet approaches his subject as a committed Christian and Catholic, but his analysis throughout his work is thoroughly professional, and indeed at times he is critical of the pious interpretations of other writers, who adduce certain mystical or miraculous aspects to what are purely physiological occurrences. There is both pre-mortem and post-mortem blood flows on the Shroud and the Sudarium. Particularly in the case of the Sudarium, there is more pre-mortem blood, as it seems to have been a type of hood placed over the head towards the end of the crucifixion to hide the grimace of the death rictus from passers-by. In the case of the three persons taken down from their crosses at the request of Josephus, only one survived, and yet none of them had been given the death blow, the “percussio”. In the case of the blood flow across the back, Barbet makes a case for it having occurred during transport from the cross to the tomb. Barbet is of the opinion that rigor mortis is manifest on the Shroud image. All four gospel accounts were written during the first century of the common era, but drew on pre-existing oral traditions and reports. The Passion and Crucifixion narratives draw mainly on Mark as their basis, set down about 65 AD, but also use their own independent traditions and witnesses, corroborating one another. They are unanimous that death had occurred. The Quranic version on this interpretation was set down some hundreds of years later, cannot be said to have the benefit of eye-witness, and to this Christian, seems to have been written from a perspective to suit a doctrinal position only. While Josephus is able to cite one single case of a survivor of crucifixion, I believe that no good case can be made that Jesus of Nazareth survived this terrible cruel punishment. Late correction: I am unaware of their being any pre-mortem blood flows on the Shroud. I cannot recall the reason why I implied that there were. As far as I know there are only post-mortem flows there. But investigators have stated that there are both pre- and post-mortem blood flows on the Oviedo cloth. Some writers have suggested that the head cloth was placed around the head towards the end of the crucifixion. However a paper I recently received notes that one end of the Oviedo cloth had been folded back on itself four times, was consequently saturated in blood, suggesting that a complete wrapping had not been possible because of the head being tilted against the shoulder after rigor had set in. Pilate was surprised that Jesus survived being stabbed in the side of his chest by a Roman soldier with his spear ?? “It was now evening … and (Joseph) boldly went to Pilate and asked for the body of Jesus. Pilate, astonished that he should have died so soon, summoned the centurion and enquired if he was already dead. Having been assured of this by the centurion, he granted the corpse to Joseph who bought a shroud, … (etc)” Mk 15:42-46. John enlightens us as to why the centurion was able to assure Pilate, because of the percussio. John’s later gospel may even have included his passage on the piercing to correct and set aright any current rumours that Jesus had not died on the cross, because of the stories about Jesus having been seen after his death on the cross. Those who read of the piercing would understand its significance. Emmett, it seems that Pilate washed his hands after the crowd demanded the release of Barabbas and the crucifixion of Jesus. He did not know each and every detail about what the soldiers did to Jesus, therefore the surprise. The Sadducees generally got along well with the Romans and any problem with the procurator would reach the emperor’s ears. Pilate did not want to lose his job. Not long after that James, the Just, a cousin of Jesus was thrown down from the Temple wall and clubbed to death with a fuller’s club when he fell on the ground. Why did this happen if the Romans had prohibited Jewish subjects from applying capital punishment? Because the procurator had been summoned to Rome and a new one was on his way to Palestine. There was sufficient time to do the job. Shroud of Turin is the only evidence we have today to prove that Jesus really died on the cross. As most of us are suspecting Resurrection of the dead body of Jesus is the only reason to print an image on the Shroud. Furthermore we have never seen a piece of linen cloth had an printed image similar to the Shroud of Turin, from a wrapped body of a living person. If Jesus had not died on the cross then we never get an image on the Shroud of Turin. To prove Shroud of Turin as a fake item, then scientists have to create a image similar to the Shroud of Turin using a living person and also have to confirm that such technology was available in the 14th century. If the Shroud is authentic (I believe so), then I agree that this would be the first scientific proof we got that Jesus really died on the cross. By the way, it would also be the first scientific proof of his existence and a great support to believe that, if he was God, he also had a real, normal and complete human nature like every one of us! But the Shroud (and the image on it) would certainly not represent a scientific proof of the Resurrection… And even the fact that the bloodstains and the fibers supporting this blood material doesn’t seem to have been broken can only been seen as a clue for this supernatural event, but not a scientific proof.